This timely book provides a wealth of useful information for following through on today's renewed concern for sustainability and environmentalism. It's designed to help city managers, policy analysts, and government administrators think comprehensively and communicate effectively about environmental policy issues.The authors illustrate a system-based framework model of the city that provides a holistic view of environmental media (land, air, and water) while helping decision-makers to understand the extent to which environmental policy decisions are intertwined with the natural, built, and social systems of the city. 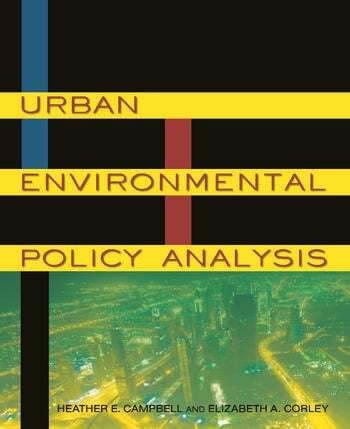 They go on to introduce basic and environment-specific policy-analytic models, methods, and tools; presents numerous specific environmental policy puzzles that will confront cities; and introduces methods for understanding and educating public opinions around urban environmental policy.The book is grounded in the policy-analytic perspective rather than political science, economic, or planning frameworks. It includes both new scholarship and synthesis of existing policy analysis. Numerous tables, figures, checklists, and maps, as well as a comprehensive reference list are included.